What's going on with the redevelopment at Earls Court? We asked Dave Hill, who you'll know from his extensive London coverage at the Guardian, to give us the story so far. 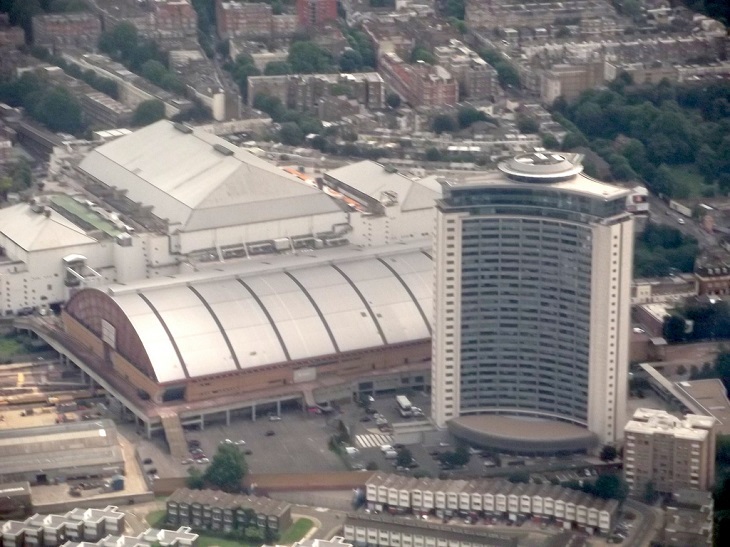 Last December, the original Earls Court exhibition centre building, Earls Court 1, hosted its final show. Today, Detroit architect C. Howard Crane’s three-sided art deco edifice is being steadily dismantled along with its younger sister Earls Court 2, the aircraft hangar lookalike opened by Princess Diana in 1991. Meanwhile, the exhibition centre’s former car park to the south of Lillie Road is becoming a residential complex called Lillie Square. Builders’ hoardings proclaim the advent of “modern garden square living” in a place “where Chelsea, Kensington and Fulham meet”. Here is steel and concrete proof that the Earls Court Project, one of London’s largest redevelopment schemes and probably its most controversial, is now well and truly underway. Ever since it emerged into the public domain in 2009, the project has divided opinion. For its champions, basically local Conservatives and its developer Capital and Counties (Capco), it is, in Boris Johnson’s words, “a landmark scheme” which will transform an untidy and rather dowdy patch of inner west London into a dazzling new district. For its various critics — and your correspondent should declare himself one of them — it is a greedy colonisation that will turn an area alive with cultural and economic activity populated by a wide range of London residents and visitors into a sterile, over-priced one, through a process that has demonstrated at every stage how to do “regeneration” badly. 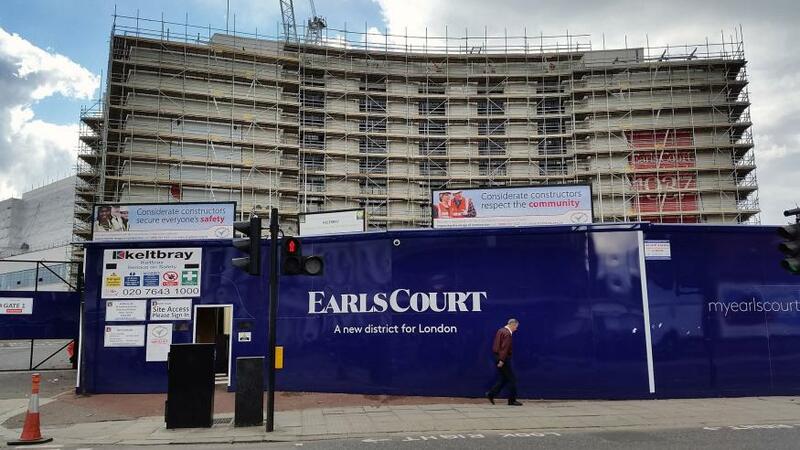 Whatever your view, the Earls Court Project is an illuminating case study of how some of the planet’s most ferociously expensive land comes to have different things built on it and of the conflicts and dilemmas this can create. It all really began in 2007, the year after Stephen Greenhalgh — nowadays the mayor’s policing deputy and would-be successor — had led the Tories to victory in Hammersmith and Fulham (H&F), the first time his party had achieved this outright since 1968. Greenhalgh began working with Capco, Transport for London (TfL) and next door borough Royal Kensington and Chelsea (K&C) to create what he later dubbed a “decent neighbourhood” in place of the existing one. The project in its present form, based on a Sir Terry Farrell masterplan, envisages demolishing everything standing on three pieces of land — both halves of the exhibition centre site, London Underground’s Lillie Bridge maintenance depot next door and the 760 homes of the adjoining West Kensington and Gibbs Green housing estates next door to that — and replacing it with around 7,500 flats, plus a “linear park”, a school, a health centre and some retail space. West Kensington Estate is earmarked for demolition. Photo by Matt Brown. Under the original plans approved by the Conservative-run H&F (in which most of the project area lies) and K&C (whose borders contain the Earls Court 1 site), some of the dwellings are to be arranged in medium-rise squares and others will reach to almost the same height as the Empress State Building, a local skyline landmark that was fleetingly the tallest commercial pile in London after its completion in 1961 and stands at the southern edge of the main development area. Lillie Square, now rising in the space between Seagrave Road, Chelsea FC’s Stamford Bridge ground and the railway lines serving West Brompton station, is its trailblazing adjunct. One-bedroom flats there went on sale “off plan” in March 2014 for £595,000. As building work continues, so does Capco’s purchase of shops along Lillie Road with a view to replacing their tenants with more upmarket traders in keeping with what they term the area’s “re-imagining”. The high and rising prices being commanded by the area’s new flats before they even exist are but one cause of objections to the scheme. The Association of Event Organisers has complained that a fast-growing London needs more exhibition space, not less, and has contested the argument that the combined benefits of improvements to Olympia just up the road and the presence of ExCel across town make up for the exhibition centre’s loss. The role of TfL has also met with criticism. The transport body is the largest landowner in the project area. As well as the Lillie Bridge depot it owns the freehold of the exhibition centre site and used to lease it to the Capco-owned company which ran the centre. However, last spring TfL entered into a joint venture with Capco to redevelop all the exhibition centre land. The side of Earls Court exhibition centre (before the project began). Photo by Matt Brown. 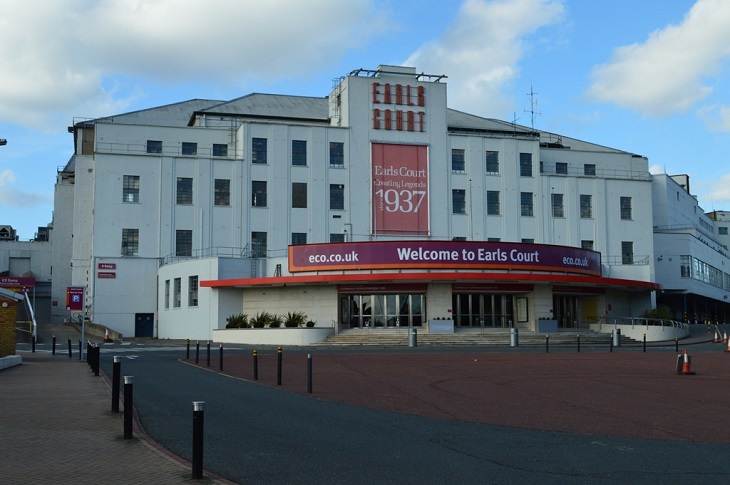 The resulting Earls Court Partnership Ltd has already secured planning permission from K&C to construct a so-called Earls Court “village” of over 1,300 units where C. Howard Crane’s creation is being taken down. It will contain no “affordable” housing at all. TfL points out that the money it will make from its partnership with Capco will be reinvested in the transport network and that local stations will be improved, but the arrangement highlights a wider issue about the best way for the mayor’s transport body to make use of its substantial land assets in the capital. Joint ventures with private developers might be a preferable approach to exploiting the value of public land than just selling it off, as Greenhalgh has done at City Hall with police property judged surplus to need. But what types of joint venture and developer partners for TfL are in London’s best interests overall? If homes are to be built on TfL land, something politicians across the board think would be a good idea, what sort of homes should they be? Then there’s the battle over the fate of the two housing estates. It was Greenhalgh’s H&F that advocated their inclusion in the project and did the deal over the sale of the land they stand on, which included a promise to replace all 760 homes with equivalent properties within (or, in some cases, close to, as it's turned out) the wider project area, to be offered to estate residents wanting them. Critics of the deal say it rode roughshod over the wishes of those residents and that the price agreed for the land was far too low in light of the package of “community benefits” Capco promised to pay for. This included supplying 740 “affordable” homes in addition to replacements for the 760 to be knocked down, representing a decidedly low 11% of the approximately 6,740 additional housing units proposed in total (7,500 minus the 760 replacements). All of the extra 740 were to be from the less affordable end of the “affordable” spectrum, meaning none at all for social rent. There’s been a trenchant critique of the viability assessment supplied by Capco to justify the affordable percentage. An energetic campaign against the demolition of the estates may have helped Labour MP Andy Slaughter hold the Hammersmith seat in the 2010 general election despite its being a top Tory target. When, to the surprise of many, Labour regained control of H&F council in 2014, hopes were raised by the new administration’s opposition to its predecessor’s plans for the estates and its pledge to “aim to re-negotiate” them. The site from the air. Photo by Matt Brown in a helicopter. However, earlier this month council leader Stephen Cowan wrote to every estate resident saying he’s been told there is “no legal way” to get the land back from Capco. The campaigners beg to differ, citing legal opinion they commissioned which says the land is, in fact, still really owned by the council. 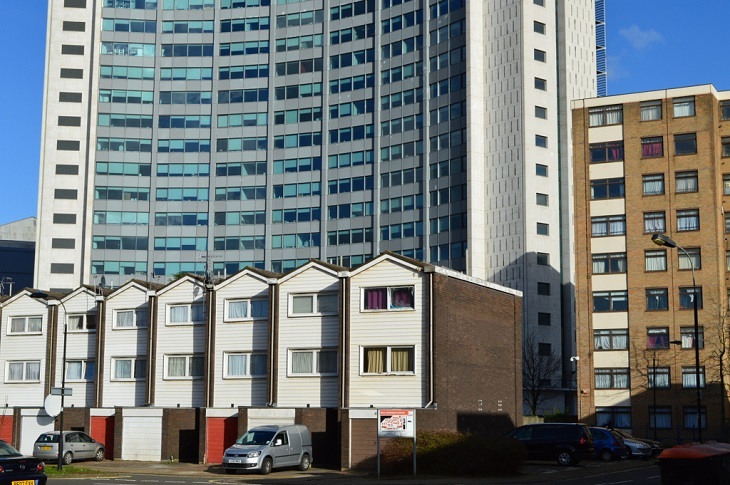 Last month, the campaigners formally began seeking the transfer of the estates to “community control” by means of a housing association formed for the purpose, saying that this would prevent them being demolished. Cowan, though, says in his letter that the council’s “firm legal advice” is to the contrary. Cowan’s letter appears to concede that redevelopment of the estates is now inevitable, although he says the council is “determined to secure a much better deal” for estate residents than the Tories accepted. That will mean a major re-negotiation with Capco of the entire Earls Court Project package as it applies to land within H&F, including the Earls Court 2 site and the Lillie Bridge depot, whose facilities TfL intends to eventually relocate to Acton. It is no secret that securing that “much better deal” might entail H&F Labour allowing Capco to build even more, high priced, high density flats in the area than had been previously agreed by the Tories as part of the inevitable trade-off. That, after all, is the way things presently work in the zany, madcap world of London housing supply and land use, whether we like it or not.